A root canal is a common procedure for treating a diseased or damaged tooth. If you have a diseased or damaged tooth that cannot be repaired with a filling, you may require a root canal. Although you might imagine a root canal to be less than comfortable to endure, it is actually relatively painless. Here at Dental Oasis of Clayton, we specialize in high-anxiety patients. When a root canal would be the most advantageous solution, we will answer all your questions so you know what to expect, and our friendly staff will make certain you are put at ease. 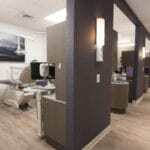 We utilize a wide variety of spa-like approaches to put you at ease during your root canal. You would be hard-pressed to find another dental office in the Clayton, North Carolina area that provides warm face cloths, pillows, blankets, neck wraps, nitrous oxide, and even Netflix and Pandora streaming, all in an effort to make you as comfortable as possible. It is no surprise that we won the “Neighborhood Favorite” award in Clayton, and we are confident you’ll agree that we’re unique once you’ve come for a visit. Don’t suffer with pain and discomfort from a diseased or damaged tooth when a root canal can get you back to efficient chewing and a pain-free smile. If you have any questions about what a root canal is or why it is the best option for your situation, don’t hesitate to call us. We are always happy to help, including giving you a second opinion if you’ve already been told you should have a root canal and want to know if that truly is your best option.